The base is instead made of a simple puréed cashew cream seasoned with nutritional yeast, sautéed shallot and garlic, salt, and pepper. We went for fresh spinach, but you can always use frozen if that’s what you have on hand (just be sure to thaw and squeeze out excess liquid before use). And once the spinach and artichokes are combined with the sauce, simply bake for a few minutes until bubbly and hot. Then serve. Swoon! This would make the perfect dip to go alongside fresh vegetables, pita chips, baguette, or flatbread! Our favorite is tortilla chips – something about the crunchy/salty factor just works. If you’re into dips, also check out our Creamy Hummus from Scratch, Roasted Jalapeño Hummus, Easy Muhammara Dip, Mediterranean Lentil Dip, and Cheesy Jalapeño Corn Dip! 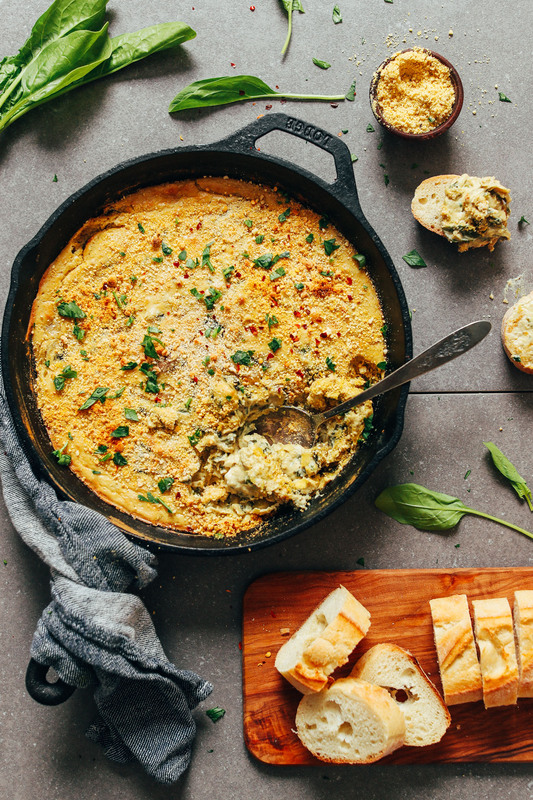 A vegan version of classic spinach and artichoke dip! 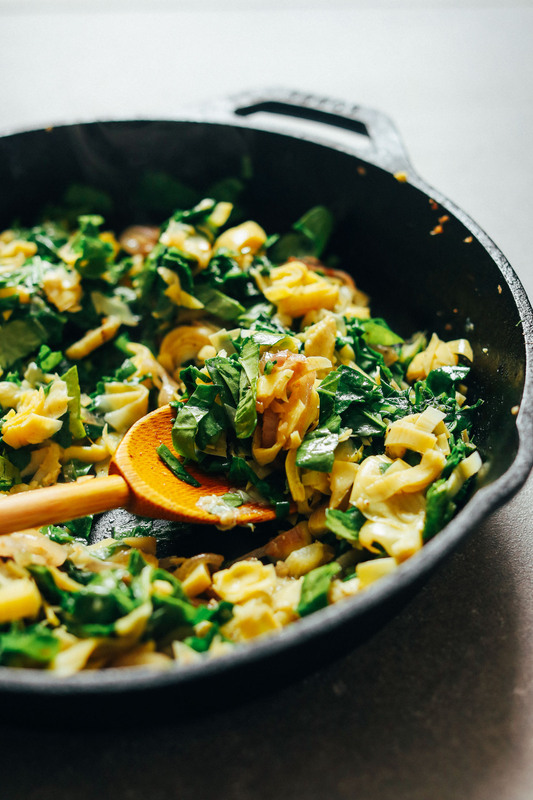 Just 10 ingredients required, creamy, cheesy, packed with veggies, and SO delicious! Bake for about 5-8 minutes or until the dip is hot enough to serve. Be careful not to over-bake or the cheese sauce can begin to dry out and lose its creamy texture. Serve hot with assorted vegetables, tortilla chips, crackers, or toasted baguette - tortilla chips being our favorite. *As written, the recipe makes a total of approximately 4 1/4-cups artichoke dip. *Nutrition information is a rough estimate calculated without optional or serving ingredients. I just made this and it was INCREDIBLE! I used artichoke bottoms because I couldn’t find artichoke hearts in the supermarket (I live in Israel and certain ingredients can be hard to find consistently) and it was still delicious. 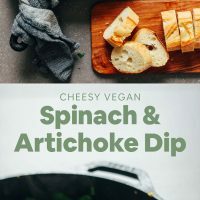 I cook vegan food for myself but am still hesitant to experiment when I’m entertaining or bringing a dish to potluck dinners, but I am excited to bring this dip to a dinner party tonight. Cut up some red peppers and toasted pita for dipping, can’t wait to see what people think. You would never know it’s vegan! Delicious! Oops actually did make some changes: used soy milk and onion in place of shallots. For anyone else who’s wondering about subs – it was still perfect! I just made this and cannot stop eating came out great, I added a couple extra cloves of Garlic and it was amazing! I made this recipe for a party to serve with fresh artisan bread. Yummy! Everybody (non-vegans) asked for the recipe. The one thing I did differently was that I stirred in a little bit (1/4 cup) of Vegenaise, just because I have too much Vegenaise in my fridge at the moment and it seemed like a good place to use it. Will definitely make this many more times. This is so good just the way you wrote it. Will be making again, so easy! This.Is.Awesome! I used onions instead of shallots and didn’t put any bread crumbs on, it was SO much better than I anticipated! I will absolutely make this again, and don’t have to feel the least bit guilty eating it! Could you perhaps use almond meal as a substitute for the blended cashews? Hoping to make this as an appetizer for a family get together, but my oven schedule is already cram packed. Could this be made in the slow cooker or instant pot? We haven’t tried and can’t say for sure, Elissa! Let us know if you experiment with it! I would like to know if I can make this ahead and serve it in a small crockpot as an appetizer. It looks great in the pan, but I think it would get cold, and I have a big meal to prep. Thank you for your website. It is all delicious and very creative. WOW, this was soooo good!!! We brought it to our vegan potluck and it disappeared very quickly!! I used soy milk and 3 tbsp of the nutritional yeast since I make my own vegan parm with cashews, garlic powder and nooch so didn’t want it to be too strong. This is a keeper! Yay! We’re so glad to hear that, Karla! Can Macadamia milk be used in place of the Almond Milk? I always have that in stock since I get it by the case at Costco’s. I’m def going to try this out. Looks delicious. Hmm, it will affect the flavor but it’s worth a shot! Let us know if you try it. I’m absolutely in love with this recipe! I cut the amount of garlic in half as I was worried that 5 cloves would be too much but in hindsight I think it would have been equally delicious. As an newcomer to vegan cooking, I was a little nervous about the cashew cream but, MB, you have officially altered my food universe! Thank you for sharing such a wonderful rendition of a comfort food classic without the animal products. I can’t wait to make it again! Do you think this could be used in spanakopita?? We haven’t tried, but I think that could work! Let us know if you give it a try + good luck! AMAZING RECIPE! I didn’t have nooch, but I did have vegan parmesan, garlic, and onion powder. I added those instead of the nutritional yeast, amounting to the same measurement. When tasting the mixture before fully cooking, I decided it needed a little more tanginess, so I added lemon juice to taste (i am unsure of how much I added but it was a decent amount). I also used soy instead of almond milk. This ended up tasting almost EXACTLY like the one my mum makes during the holidays — but VEGAN! Good for body, planet, and animals (in my opinion)! I served this as a little dip type thing in a salad bowl with cold sushi rice (leftovers! ), grape tomatoes, cucumber, and cooked sweet potato. AMAZING! If you add ANY additional ingredient, I’d recommend the lemon juice — definitely elevated the flavour of the artichokes. I also think the lemon juice mimics the flavour of the sour cream used in many traditional recipes. Thanks for sharing, so delicious! Can this be frozen before baking? I have to do most of my Thanksgiving stuff ahead of time. Hi Lisa! Unfortunately, this recipes does not freeze well. Store leftover dip covered in the refrigerator up to 4-5 days. Reheat in an oven-safe dish at 350 degrees F (176 C) until warmed through (or in the microwave), adding more almond milk as needed if dip has dried out. This was soooo delicious!! Was a hit at my friend’s dinner party! I baked it for 10mins at home and then lugged everything to their house and broiled for 4-7 mins in their oven before putting it out for everyone. Very very tasty! Only additions I made was adding about a tablespoon and a half of tapioca starch to the blender mixture (helps with the gooey/stringy cheesy effect), I sprinkled smoked paprika on top with the red pepper and bread crumbs before baking, and I used 2 TBs of panko crumbs (instead of bread crumbs) since that’s all I had. I also omitted the vegan parmesan cheese. Great job on this one. Thank you!! Would oat milk work as a substitute for the almond milk? This turned out great! I added about 1Tbsp more nutritional yeast and another 1/2 tsp salt. Will try adding some lemon juice next time, too. Overall delicious! Whoop! Glad to hear it, Shannon! Yes, this is vegan, and it’s amazing! 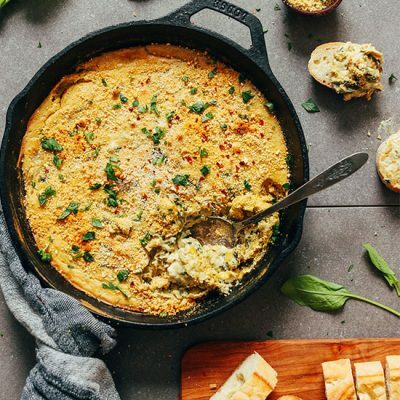 Vegan Spinach Artichoke Dip tastes like the traditional dish but so much better. Soy, dairy, oil, and gluten free! This was absolutely delicious–but–although it was cream-colored after coming out of the oven, it turned grey after sitting in the fridge overnight! And not just a little grey, truly a dark grey-brown color. I’m not sure what I did wrong; maybe added too much black pepper? The taste and consistency was not affected, so it was still delicious, it just didn’t look appetizing. Kind of a bummer as this would be a perfect “company” dish. If I try it again, maybe I’ll switch to white pepper instead of black. Hmm that is indeed very odd, Shannon. 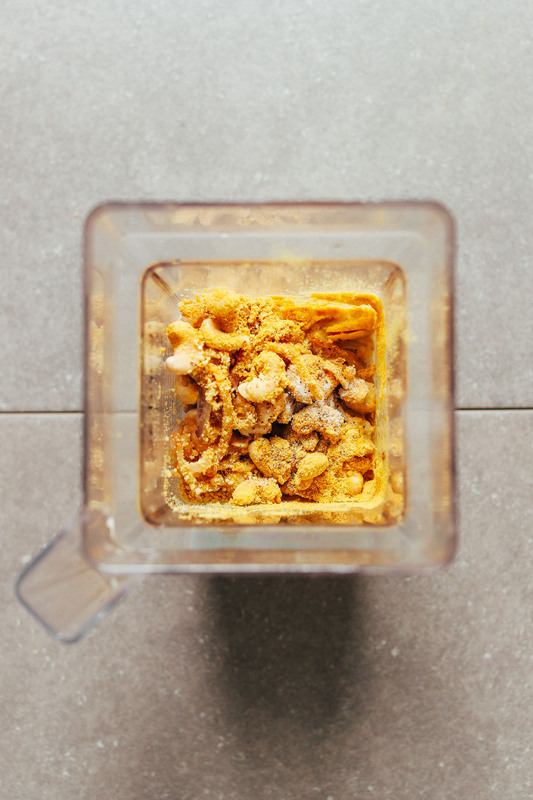 For a more vibrant color, I’d recommend adding more nutritional yeast and if you added quite a bit of extra pepper, that may have affected it as well. We’ve made this twice now and had the same problem – it just doesn’t look appetizing after its left for a bit. I defintiely didn’t petter too much, but I think its just a case of the colour of the artichokes (I don’t know where you buy yours, but the colour is so much nicer than the tins I buy!) mixed with the green spinach. Its not a huge deal as its still super tasty, but yep, it would definite be nice to have the more golden colour! This was so good!! I halved the recipe for my family, and it was quickly devoured. I missed spin dip and this was perfect! Yay! Glad to hear that, Emily! Is it possible to use frozen artichokes? We haven’t tried but I think it should work! Let us know if you give it a go. We loved it! Eating whole foods like this instead of the original means you fill up faster and stay satisfied longer. My husband and I couldn’t eat dinner after having this on our picnic lunch! Such a delicious recipe, definitely a crowd pleaser! You must have been a dairy and meat eater because you’re able to get these recipes true to the original taste minus all the nasties! Thank you!! I just made this dip. It is amazing! My three granddaughters love it too. Thanks for the awesome recipe. It’s awesome! I used vegetable broth instead of oil. I didn’t have raw cashews, so I used roasted. I think it would be better with raw (less cashew taste) but it’s still yum! HOLY CRAP. THIS WAS SO GOOD!!! I have to use all caps!!! In fact, it was so good that I just texted a picture of it to my mom, who doesn’t care about vegan cooking at all, just because i was so excited. She said, “Good! Eat the whole thing! You’re too skinny!” The only modification I made was that I only used 1 tablespoon of nutritional yeast because I don’t care for the taste too much. But a small amount was perfect! Oh, I didn’t have shallots, but onions worked great. Thank you thank you! You’re a freaking chemist in the kitchen! PS, I also didn’t have any vegan parm, but it is delicious anyway! I added a splash of lemon (about 1 tsp). What is this ingredient? 5 Tbsp (adds cheesy flavor), the recipe doesn’t say? I’m thinking nutritional yeast but?? Oh my word just made this!!! What else could I use instead of nutritional yeast? I avoid it as it is too acidic. I also read it supposedly is really bad as it ferments in digestion & produces toxins inside our bodies… sad! Hmm, not sure about that. It is a key ingredient in the flavor. But you could just sub some miso paste and maybe up the garlic. Miso paste. Thank you! Iam not a true vegan but I prefer most vegan recipes. However every time I see nutritional yeast as an ingredient, I walk away. I really don’t like the flavour. But now I know miso paste is an option I have a whole new world to explore. Thank you so much! One more step towards veganism. Omg I have to try this ASAP! I love spinach dip but am trying to cut dairy so this is perfect. Yummm thank you! 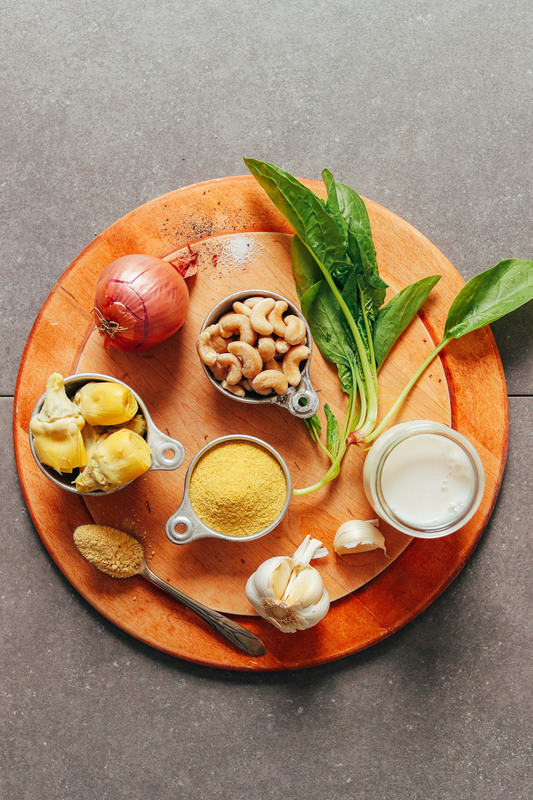 Do you think the cashew base used here could be swapped for the vegan cream cheese used in your jalapeño corn dip recipe (and have a similar taste)? Thanks! I suppose, but we haven’t tried using just cream cheese. Let us know if you do! My son has allergy to just about all tree nuts, is there anything that I could substitute with? Piggybacking on this comment! I would also love to know if there’s a nut substitute! I haven’t made this recipe but I’ve made another vegan spinach and artichoke dip that required cashews. I’m allergic to all tree nuts and peanuts too. I used sunflower seeds instead and it was delicious! Looking forward to trying this recipe with sunflower seeds. I wonder if hemp seeds would work too? Never tried it. But they seem to have more of a “nuttier” flavor. To get the creamy factor I would suggest blending some steamed/boiled cauliflower. It gets REALLY creamy when blended at high speeds. Thanks for sharing, Rachael! Such great info. Daya ‘s jalapeno Harvati style cheese is …delicious ! my favorite…always in the fridge. take this from a French person ! We have an allergy to cashews. Could soaked raw almonds work instead? I prefer the taste (and price) of almonds and usually use them instead! Thank you! I’ll try it! Also wondering about garbanzo beans – chickpeas as a nut substitute? Maybe it’ll lose the creaminess factor though? Miyoko vegan cheese has a great cream cheese and butter.